The air going under the car takes a straighter path to the rear than the air going around or over the car and according to Bernoulli's theorem,it's pressure would be higher than those other two pathways.---------------------------- With respect to the airdam.if it is no lower than the lowest undercarriage member,then it will not aggravate frontal area,causing a drag increase.Whether the air should go over or around the car is actually something that should be taken on a case specific basis.Currently,airdams are configured to encourage flow around the sides of vehicles.------------------------- With respect to the template,I'd like everyone to ignore the forebody and contemplate the rear aspect of the car.This is where the low-drag challenge resides. I love how these look. The charm of the hand drawn templates is something I miss with most everything done with computers now. I think this is a good visualization tool. I have been trying to find something like this for a while. Now I just have to decide where to cut it off. I may just build a full length detachable cone section aft of the kamm. Why should Basjoos have all the fun? Just wanted to mention that the only way the template works,is if the height of the vehicle measured from the road surface is scaled to fit under the curve. I've been thinking that we should do a separate thread exclusively for wing sections.I've been playing a game of catch up,reading a little deeper into my texts and see the wings with mixed feelings.Here are some random observations 1) wings operate in free air which is virtually turbulence free. (2) automobiles operate in air which is all turbulence. (3) Virtually all the drag of a wing (unless it stalls) is skin friction. (4) Only about 7% of an automobiles drag is from skin friction,with 55% from profile drag. (5) Wings reach their lowest Cd(min) at aspect ratios of 4-5,and "practical" aspect ratios for wings are in the range of 3-9,and as high as 20 for sailplanes. (6) a wing used for a automobile body could have only a fractional aspect ratio,its tabular data unusable according to Abbott and von Doenhoff. (7)"Flight" Reynolds numbers of 6-million can be achieved at Re 2,000 due to turbulence in ground-effect,and at 20-mph. (8) What would otherwise be a "laminar" wing in free air,will transition to turbulent boundary layer at normal automotive ground clearance and low road velocity. (9) crosswinds would be the same as angle of attack change to a vertical wing section,Cl would quickly climb,as would drag( for example,a Clark-Y in a 17-degree relative wind would see a 180% drag increase),creating a pitching moment about the aerodynamic center. (10)0.0005-inches roughness or less is permissible for at the leading edge of a laminar wing,so dried bug juice and insect remains would be enough to scuttle the low drag of these high performance sections,not to mention free turbulence.----------------------------------------------------- Wings are great and I love what they do.I'm just having a time of it trying to wrap my brain around using their performance criteria in the context of an automotive body.Jaray's form does resemble a Clark-Y from the side,but with all the rounding off of edges on the side and nose,"pumpkin seed" seams a better fit for a descriptor.With the "mirror-image" my brain sees the body of a "pair-of-grins" falcon in full stoop at 250-mph. "The air going under the car takes a straighter path to the rear than the air going around or over the car and according to Bernoulli's theorem,it's pressure would be higher than those other two pathways.-------------------------"
If the path for the air from the front stagnation point to the low pressure zone at the rear is very smooth, the pressure difference, along with the restriction from the ground, can move the air as quickly as the air going around. This is one of the major techniques to produce downforce for racing - the venturi bottom. I understand that the NACA 6-series wings, and pretty much all foil shapes, produce the lowest drag while in flight, where air is less turbulent and there is no ground deflection. Since these shapes are so susceptible to imperfections (bug guts, cracks in shape, roughness in shape, etc), what then would be the optimal shape for a road vehicle? 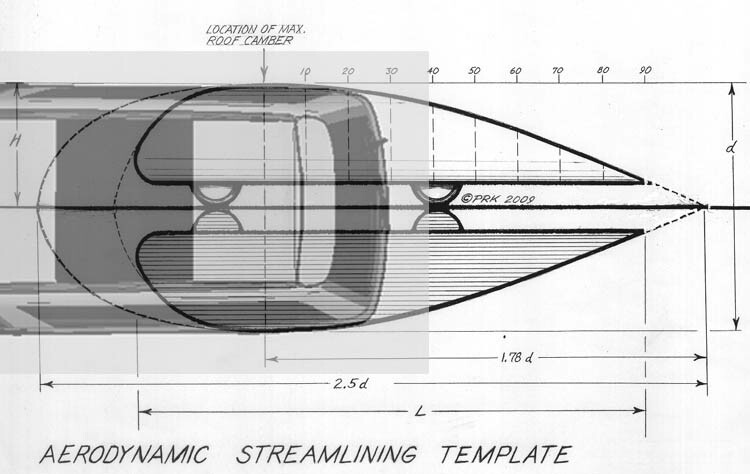 Is it worth even attempting to use a low drag foil shape, like the NACA 6-series, on a road car at that rate? 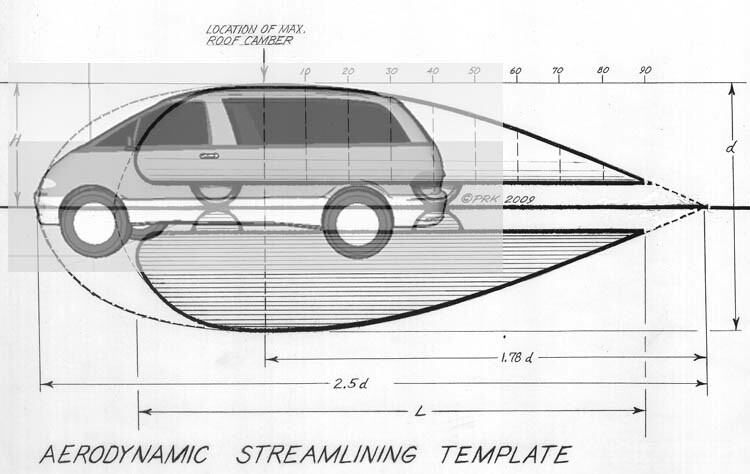 Are you suggesting that a simple shape following the template you have posted would have less drag and more laminar flow than a car designed around a NACA foil, considering every day road conditions? Would it be safe to say that a shape which has the least average drag from -10 degrees to 10 degrees would be the optimal to select for a road vehicle? This is one of the major techniques to produce downforce for racing - the venturi bottom. Some people have reported a loss of mpg after installing belly pans. What are some possible causes for increasing drag with belly pan? For instance: If one inadvertantly created a venturi under a car would that increase drag? Or is that venturi unavoidable? If a van was nose down due to rear seat removal would that increase drag? Is parallel best? I was trying to get the tail shorter but I guess you can't fool physics. (Or aerohead or bicycle bob) Darn. By the way here is the link to my newly finished roof and sides extensions, soon to be kamm back. I'd be thrilled if you would give it a look. It was mentioned to me to concentrate on the rear end. It's a start. contemplate the rear aspect of the car. This is where the low-drag challenge resides. blunt end forward, taper aft is the way to go for low drag. issue is air pulling on the back as aerohead says. around the car and the tube due small clearances. Last edited by Rokeby; 07-30-2009 at 06:10 PM.. I'm in town without the aid of my library(as usual).Relying on memory,and referring to Wolf Hucho's text,under vehicle flow will never reach ground speed velocity for typical passenger vehicles with typical ground clearance.He provides some quanta for anyone wishing to run some numbers.-------------------------- In the case of racing vehicles and record cars,sure,you can "idealize" the bottom of the car.Dr.Michael Seal of Western Washington University created the 100-mpg Viking series of cars with high ground clearance and an inverted airfoil underside to provide downforce.The smooth belly cut drag and the profile helped with added stability.-------------------------------- The other school is to lower the car into the weeds,with ground skirts and tunnel effects with diffusers.Whatever the sanctioning body will allow.------------ This second approach requires ground clearance which would not survive the light of day in day to day commuting. I don't have your wing section,but I spent some time with the NACA 67,1-215.It's drag coefficient(min) occurs between a lift coefficient of 0.175 and 0.375 which from the table,occurs for a range of angle-of-attack between zero and 2-degrees.Here's the kicker,by just changing the angle-of-attack 7-degrees(something quite common in crosswind driving),the Cd rises to 0.0162 a 490% increase.All the 6-series airfoils have a "sag" or "bucket" in their performance curves,and lift (drag) increases rapidly with very small wind direction change.----------------- The other thing to bear in mind is that laminar wings are laminar only up to the first minimum pressure location,and in this adverse pressure gradient,the wing will immediately transition to a turbulent boundary layer.----------- This doesn't mean that flow will separate,it only means that friction drag will increase,bad news in an airplane,but actually good news for automobiles because turbulent boundary layers can sustain attached flow just above the boundary layer,and attached flow is what we need for drag reduction in cars.-------------------------------------- The thing about the template,it is borrowed from a "wing guy"(Jaray"),who,while well acquainted with the tastiness of wings,found the "pumpkin seed" to be more delicious for low drag automobile forms.You will find numerous land speed record cars and solar cars which even today,rely of this form for top honors.-------------- For the template I chose the 2.5:1 fineness ratio as a "minimum" for a 3-dimensional form in 3-dimensional flow,in ground effect.This selection follows a logical linear progression from Jaray's streamline body of revolution completed in it's mirror-image ground reflection,and the German research which isolated the 2.5:1 ratio as having the lest drag.No real Einstein moments there.--------------------- The template respects streamline flow with an economy of structure and literally guarantees attached flow,at least if you don't cheat the minimums.----------- YOU CAN make the body with higher fineness ratio,I just want everyone to understand that there will be a small penalty to extra skin friction.And the good news is that since skin friction plays such a minor role in road vehicle aerodynamics,you won't really nshoot yourself in the foot if you do go longer.--------------------- Getting back to your question:the pumpkin seed will not exhibit drag increases anywhere near the same continent as wing sections in crosswind conditions,the drag will be lower,and while the boundary layer is turbulent,it will be impossible for the flow to separate up to the point you choose to "chop" the body,as Dr.Kamm did on his famous series of cars. I have no published reports which suggest that a problem such as this is possible.And not to dis-respect those claiming the degraded performance,I'd have to be there to investigate it myself and do some mutual head-scratching.----------------- I do have a paper from FIAT which experimented with a bagful of vehicle configurations and they did observe that by altering undercar flow,the uppercar flow can definitely be affected.Obviously,if you have the proper tools,you can quickly isolate an area and remedy it.---------------------------- With respect to a venturi,this is something you'd really have to work at creating.If the pan is parallel with the ground until it can begin a continuous upsweep angle for the diffuser everyone should be okay.------------------------- As far as your stainless roof extension,I've been watching it.If you're anywhere near Sanger,Texas,you can drop by and teach me Metal fabrication technique,She's a beauty!------------------ As far as the drag reduction goes,you can't cheat on the curvature,and your drag reduction will be an arithmetic function of the new,smaller wake area the extension creates as compared to the vehicles original wake.--------EXAMPLE: your extension allows for a 10% wake area reduction,that translates to a 10% drag reduction.Simple huh?-------------- A 10% drag drop would net you 5% AND 6% MPG improvement at 55 and 70 mph respectively.-------- So using,say the template,you can engineer your extension on paper and know the results before you ever begin buying materials.--------------- And yes,the rear is where the action is.Since 1922 the rear of the car has been known to be the chief source of drag for ground vehicles,and the only way to reduce it,after attached flow is in the bag for the forebody,is the gently tapering tail as depicted in the template.